Remember my Husband-Made Kitchen Table? At long last, we finally have some instructions on how to create one yourself! Unlike the Barn Door Track, this project could probably be finished by a beginner, or at least someone who has used these tools on smaller projects a time or two. The base of the table was inspired by this tutorial on The Art Of Manliness, but we modified it to give us enough space to seat one person at each end of the table. We also opted not to paint the bolts because we liked the look of the exposed hardware. 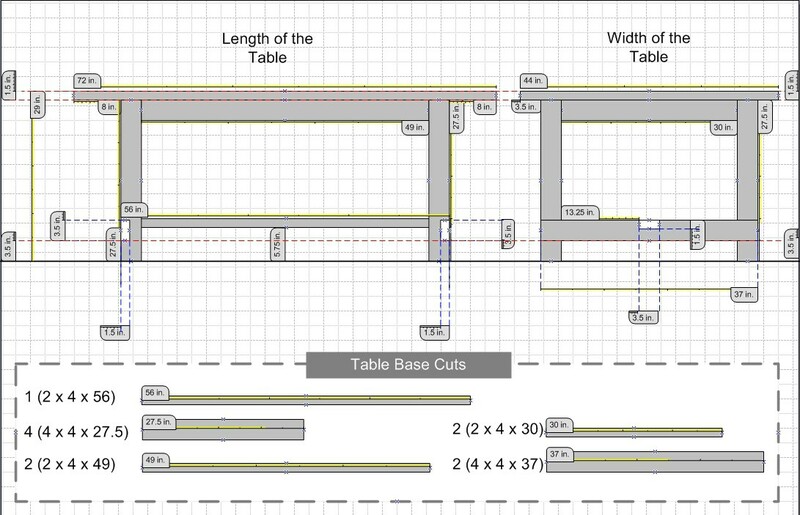 The diagram below will give you a visual of how to cut the wood and put it all together (click on it to see it larger). For more specific instructions on how to piece the base together and cut the notches, please refer to the original tutorial on The Art of Manliness. *Note- To prevent splitting your 2x4s when attaching the legs to the top of the base, drill a 3/8″ pilot hole through the 4×4. Hold the 2×4 flush against the 4×4, then use a 1/4″ drill bit, and drill through the 3/8″ pilot hole to create a smaller 1/4″ pilot hole with a 2.5″ depth for the 2x4s. The top of the table is made from leftover hardwood flooring pieces (from the floor we installed last year). Click through if you’re on my homepage to see the 2nd half of the tutorial. 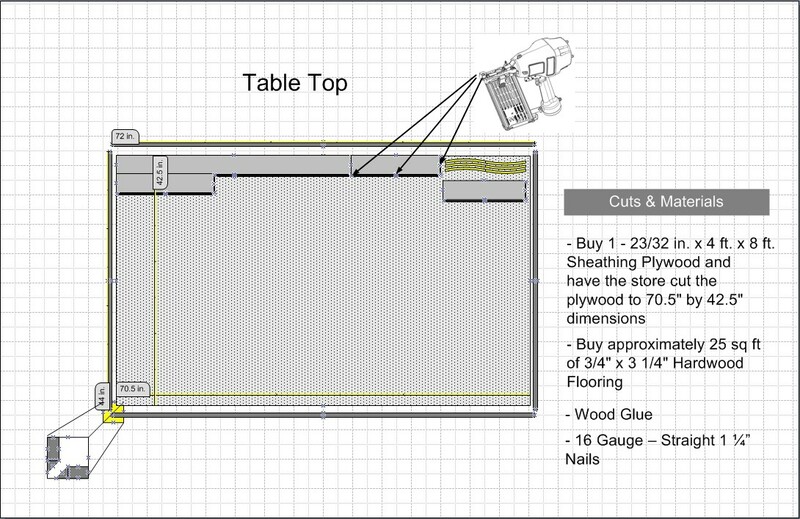 Start by having the hardware/lumber store cut your plywood to size. See diagram above for dimensions. If you don’t already have hardwood flooring lying around from a previous project, you’ll have to buy about 25 sq. feet of it. We used utility grade hardwood (which is the least expensive option), but you can use whatever you’d like as long as it’s real hardwood flooring. Apply glue to the plywood, and then adhere the flooring pieces to the plywood, using your nail gun, like you would if you were installing it on the floor. Continue row by row, making end cuts where needed to keep it the size of the plywood piece. Take a piece of hardwood flooring (or 2 or more, if needed*) that is the length or width or the table, and rip it down to 1.5 inches wide. Line it up to the side of the table top, glue and nail it down. *You may not wind up with hardwood flooring pieces that are long enough to edge the table, so you’ll have to take 2 or more pieces and join them to match the total length or width of the table. We made a 45 degree corner cut at the end of each edge piece for cleaner corners, but you can choose to leave the ends flat. Just adjust the length of the other edge pieces to account for that. Use your wood filler to fill in any cracks and holes in the table top. We use the JB Weld Kwik Wood Epoxy/Putty stick for large holes. Sand the table top. We started with 60, then sanded again at 80, and finally at 120 grit sandpaper. Clean it well, then stain to your liking. For our table, we used Minwax Ebony stain, followed by Minwax English Chestnut. Then we applied 3 coats of Minwax semi-gloss polyurethane. After the final coat of polyurethane is completely dry, do a light sand with 220+ grit sandpaper. To attach the table top to the base, lay the table top face down on the floor, then center your upside down base on top of it. Here’s a view of ours upright, taken from underneath. Use 2 90 degree angle brackets (like these), to attach the base to the table top on each long side, and one on each short side. That is GORGEOUS.You’re sort of a genius. I’m in the process of having a table built and really want to use those chairs. From overstock.com right? Can I ask if they’re comfy? The husband is worried they’ll be too uncomfortable for every day use. I just sent this to my husband. I’ve been telling him about this table since I read the first post. I am inspire your post because u have told in this post very helpful tips for wooden work and your reference pics is very perfect and i am thank full you and you help out in wood floor now these instruction i keep in mind before the any wooden work and make and wood table and floor. I’m going to have my husband build this. Any idea how much the whole thing cost you? There’s definately a great deal to know about this issue. I love all of the points you’ve made. om stock cabinets. Did you cut the notch off the floor plank length wise so that the wood edge was flush? You have saved me a ton of money!!! I have a question, I also have left-over oak flooring pieces, I think exactly like the ones you used (18mm thick, 20cm wide), and I also want to make a nice table out of it. I have been doing some research on internet, and a lot of experts say it is not wise to fix hardwood on top of another layer of wood, because the oak will expand/shrink and it will probably get crooked if you fix it. But apparently you did it like that anyway, and it looks really nice!! So my question is: didn’t your table get crooked after a while? Did you know about this, and did you take any precautions to prevent that, or to give the wood space to expand? Thanks a lot for the inspiration, I’m really looking forward to start making the table!! Hi Wouter! So sorry for the delay. It hasn’t affected our table at all. When we installed our floors, we did leave room around the edges of the rooms for expansion, but the table has been fine. It’s not subject to huge temperature fluctuations frequently, and it doesn’t get wet enough to expand because of the finish we put on it. The wood was already climatized (sat for several months in our garage) before we made the table with it. Best of luck to you! Hello- I was so excited to see your post! I’ve been mulling over a very similar idea — inspired when we came across some hardwood flooring for a steal. I REALLY want to do a 60 inch round table though. My issue is figuring out how to get plywood large enough for a 60 in base and how to finish the edge cleanly. Do you have any ideas? We have stalled the project while we try to figure this out ???? Get free sewing patterns to download right here at Vykroyka.com.ua! The best free sewing patterns & projects on the web! And all organized by category so you can easily find the project you’re looking for. Just print the free patterns on your printer and begin sewing. I live in Webster Groves, Missouri and there are several habitat for humanity stores near where I live. I got everything I needed for this project for under 50.00. I used stair noses for the edges, giving the table a rounded look. I was able to use oak because I got everything second hand. The flooring is always inexpensive but one of the days I went they had a ton of oak stair noses so I was able to buy 20 8 foot long ones for $1.00 each. It took several trips to find just the right support to us as legs but I only paid $2.00 each for the 4×4’s I used. I had the oak flooring leftover from when I had floors installed in my house, but you can buy from habitat for less than $20.00 a box all the time. I still had to buy the hardware at the store which was the single most expensive part of the transaction.